Ferrari has announced the final model in its mid-engined 458 sports car range. Ladies and gentlemen, welcome to the 458 Speciale A. 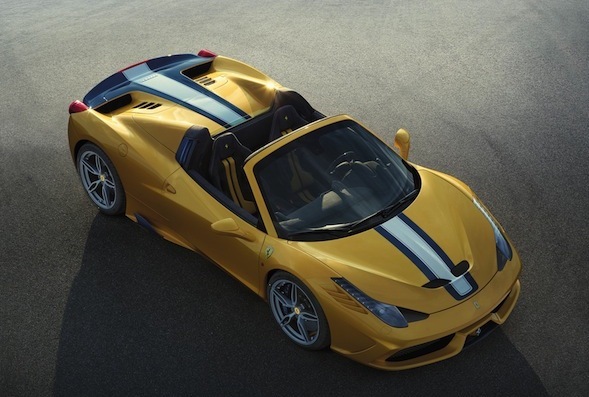 Essentially a convertible or 'spider' version of the track-biased 458 Speciale model, the A (short for 'Aperta' – Italian for 'open') is set to be the most exclusive model in the 458 range, as just 499 examples are to be built, the same number as the Italian marque's cutting edge hypercar, the LaFerrari. The new model shares its heart with the 458 Speciale – a 4.5-litre V8, massaged to develop 597bhp, some 35bhp more than the regular 458 Italia. This sonorous powerplant is mated to a lightning-fast seven-speed twin-clutch automatic transmission, which has also been reconfigured for greater performance over the standard car. The Speciale A also benefits from a comprehensive weight-saving program, making it 90kg lighter than the standard 458 Spider. Amongst the changes are forged alloy wheels, and a new, free-breathing exhaust system. Carried over from the hard-top 458 Speciale is the aggressive aerodynamic bodywork, which features a front bumper with active aerodynamic flaps and a large rear diffuser. Claimed performance figures for the Speciale A are astonishing. The car will romp from 0-62mph in three seconds flat, beating the 458 Spider by 0.4 seconds. It also gets around Ferrari's Fiorano test track in 1minute 23.5 seconds – faster than the marque's flagship hypercar of the 2000's, the Enzo. Making its debut at this week's Paris motor show, the 458 Speciale A will be presented in a unique yellow livery (pictured), featuring a blue and white stripe, with Alcantara and carbon fibre trim featuring heavily throughout the interior. Prices are yet to be announced, though they are expected to start from around £220,000. With Ferrari introducing turbocharging to its cars to improve fuel economy and CO2 emissions, expect that price to rise significantly over the coming years, as collectors clamour to own what could be one of the last ever naturally aspirated V8 Ferrari road cars.